The St. Elsewhere fakeout. When St. Elsewhere ended in the 80s, they revealed the show was all the imagination of an autistic child. He was looking into a snow globe of the hospital in the final scene. 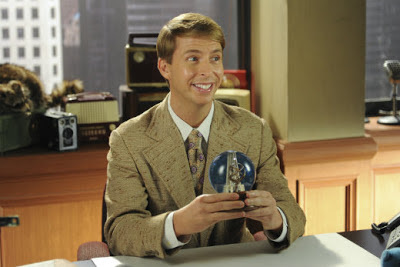 The final scene of 30 Rock we see Kenneth looking into a snow globe of 30 Rock and it seems like it could be a dream but then it's not a dream. Good fakeout. Jenna's 4th wall fakeout. She looks right in the camera and confesses to never have met Mickey Rourke. But then cut to another angle and Liz is looking around puzzled and Jenna was just talking to no one and not the audience. Liz's hallucination. It what appears to be another 4th wall joke, a fake promo for Griz and Hers appears. But only Liz sees it and I like to think she was having a hallucination probably because she was seeing an opportunity to work on this new show. Lutz and Blimpie's. Not Subway or Quizno's. Not the newcomer Jimmy Johns. Lutz of course wants Blimpie's. Transparent Dishwashers. Really, why aren't these a thing? When I was a kid they had these at Sears so you could see what was happening inside. I have always wanted one. It was just the best ending to one of the best series ever.